There is a deep mismatch between the skills our education systems nurture and the needs of society. In a typical Western education system, results indicated that “since 1990, even as IQ scores have risen, creative thinking scores have significantly decreased”. Traditional education does not sufficiently value innovative and entrepreneurial thinking – our system even dumbs down the creative genius that we were born with, according to a test developed by NASA. 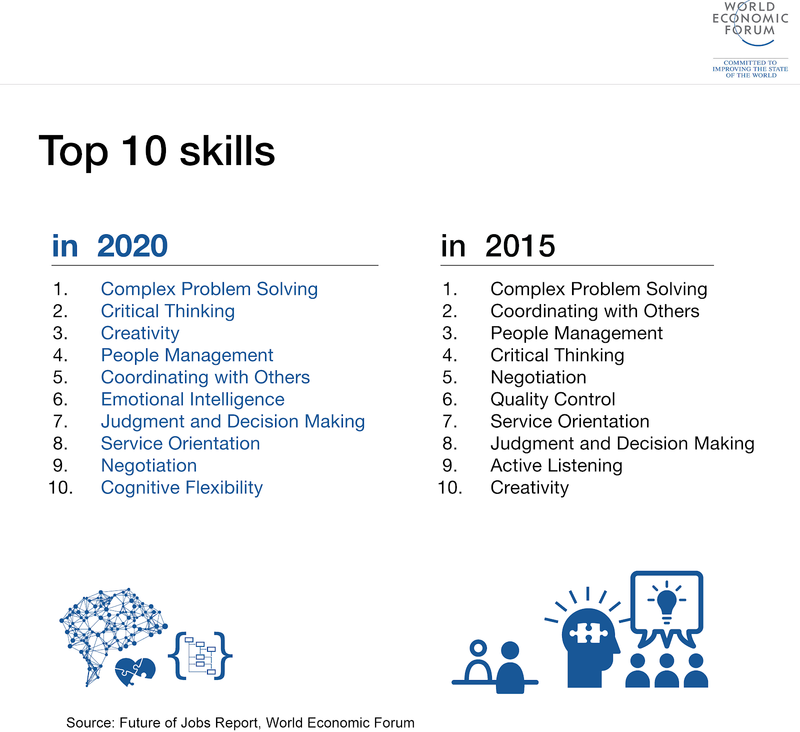 Yet creative skills and mindsets are indispensable in a workforce that must be responsive to change and capable of finding new solutions to complex problems. The World Economic Forum itself has identified social abilities such as coordinating with others and persuasion, as well as complex problem-solving skills, as essential in the knowledge-based workplace of the near future. We live in the times of autonomous cars, reusable rockets and artificial intelligence, yet we are still teaching in an education system that was set up for factory workers some 200 years ago. What we should be doing instead is to focus on skill-building and setting any learner – be it in compulsory education or in lifelong learning – up for success. Entrepreneurial education teaches the important skills of innovative and creative thinking, helping people develop a flexible “growth mindset” that can adapt to new problems. It is not about teaching business skills such as accounting and pitching, but what it means to be entrepreneurial – what mindset does an entrepreneur have, how does she stay motivated, how does she solve problems, and get people to see and follow her vision? These kinds of skills are useful beyond the job market. They give people the tools to be active citizens in a complicated and fast-changing world, and should be a priority in European policy. According to the European Commission’s new Entrepreneurship Competence Framework, entrepreneurial education includes life skills as well as business skills. It means learners can act upon opportunities and ideas and transform them into value for others, whether financial, cultural, or social. Despite the importance of this mindset, according to a 2016 Eurydice study, no country has made entrepreneurial learning mainstream within education, no country effectively assesses student learner outcomes, and few countries have embedded experiential learning to develop this mindset and skills. What would it look like to teach creativity as entrepreneurial skill? Currently, creativity is often limited to one-off activities such as brainstorming or mind-mapping, rather than a continual emphasis on creativity throughout learning. Research into creative mindset development indicates a minimum of four to six months’ continuous development is required to develop the neural capacity and enhanced plasticity required to be creative. Ideally, this learning should extend across the whole age range of formal and non-formal education. Short-term “stun and run” creativity activities such as brainstorming or mind-mapping have limited value. Yet established entrepreneurship education programmes prioritize experience of the business start-up process. These programmes are not demonstrating positive impact in terms of the student perception of their own entrepreneurial capacity or their interest in following an entrepreneurial career. There is a focus on the process of business development rather than a specific focus on the creativity needed to continually innovate; while this is valuable, it may miss a significant opportunity to equip individuals with the innovative and creative-thinking capacity they need. Education neuroscience indicates that without a sustained deep-learning approach, the levels of creativity will continue to fall as children progress through formal schooling. Prevalence of competition-based formats linked to start up or business ideas is detrimental to learner development in terms of self-belief, entrepreneurial skills and ethics. Entrepreneurship education has coalesced around an understanding that winning is a goal, yet research shows that this is patently not the case. Creativity as a skill: learning more is ineffective unless you can relate and link it to something else – if we so wish, we can think of the brain’s neurons as inherently “sociable” in that they wish to contact other neurons that they already know and are comfortable with. But creativity is about creating new connections; by teaching divergent thinking, we enable new connections in unexpected ways. Creating innovative business models: equips young people with the skills to respond to the business opportunities they identify, equipping them with the competencies to adopt and create innovative business models aligned to their particular product or service. Creating new markets and new jobs: new jobs and new markets are heavily reliant on innovation and spotting opportunities. By teaching entrepreneurial skills such as spotting opportunities, ethical and sustainable thinking and vision as laid out in EntreComp, new ideas for communities and start-ups will emerge, increasing employability of young people and developing the entrepreneurial and innovative skills required by employers. But what should happen instead? Entrepreneurship education needs to be embedded across subjects in mainstream education for every learner in compulsory education – and for everyone who wishes to build these skills beyond. There are great practices out there spearheaded by educators, business people and policy-makers. We should hear from educators like Rana Dajani, who fosters entrepreneurial skills in her cell biology class in Jordan, or be inspired by more than 70 examples, ideas and tools collected in the European Commission’s EntreComp into Action guide, which outlines how the framework can be used across different domains such as education, but also in youth work and in employment and start-ups. For example, the EU-funded CRADLE project (Creating Activity-Designed Language-Learning Environments for Entrepreneurship Education) aims to develop a new teaching methodology for primary schools and will employ a cross-curricular, activity-based, student-centred, exploratory teaching and learning approach, focusing on the simultaneous development of foreign language and entrepreneurial skills among young pupils (aged 8-12). The implementation of the CRADLE methodology starting in primary schools will increase the benefits of transporting the acquired skills into secondary school and, ultimately, beyond school boundaries into the pre-professional and professional world. The good news is that in Europe, education, economic and employment policies are shifting in the direction of outspoken support for entrepreneurial learning. Entrepreneurial skills are part of the New Skills Agenda for Europe (2016) and have been included in the recently reviewed Key Competence Framework of the European Commission (2017). The Eurydice study on Entrepreneurship Education at School in Europe (2016) highlighted the significant gaps on entrepreneurship education across Europe, which resulted in a higher priority for funding allocation. 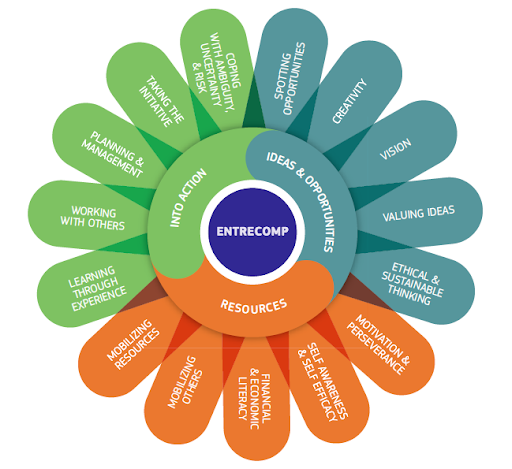 And the EntreComp framework has laid the foundation for a common language in which skills are entrepreneurial, and the value of entrepreneurial skills at all levels and through its user guide given more visibility for practice – which in turn will be able to influence policy-making.